Etsy is an online marketplace where hundreds of thousands of creative people from more than 150 countries sell their handmade crafty goodness. Each week, we’re featuring a handful of our favorite items in our Etsy Roundup. On the menu this week: Easter home decor. With Easter just around the corner, it’s time to prepare your home for the Easter bunny’s visit! There’s no place like Etsy for great Easter home decor. From wreaths to (wood) Peeps, you’ll find it all on Etsy. Welcome the Easter bunny right away! A festive and seasonally appropriate Easter wreath is just the decor piece you need to spruce up your home for Easter. Etsy sellers A Work of Heart SA (find the sisters behind the store on Twitter, Facebook or on their blog, A Work of Heart) crafted this wreath using assorted plaid, solid and gingham spring-colored fabrics with 10 different gorgeous ribbons tied throughout. 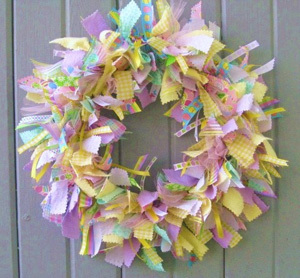 You could also use this Easter wreath as a candle ring on a table. Peep, peep. Everyone’s favorite sugar-laden Easter treats can sit atop your mantel in all of their pastel glory. This darling piece of woodwork by Etsy seller Silver Specialties (find her on Facebook) is a great way to bring Easter to your home. 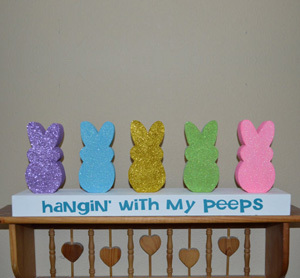 The wood Peeps Easter bunnies are mounted on a wood block that reads “hangin’ with my peeps.” The Peeps are covered wtih glitter for a fun touch. 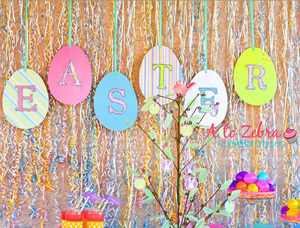 Etsy seller A to Zebra Celebrations (find her on Facebook, Twitter, Pinterest and her blog) made this perfectly festive Easter banner to bring the holiday to any room. Each letter is on its own egg and the piece measures 7 by 10 inches tall. The banner comes with ribbon and is ready to hang. For those who really want to make an Easter statement, we have another wreath for you. 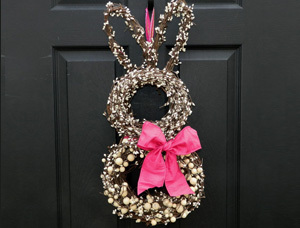 This insanely adorable Easter bunny wreath by Etsy seller Ever Blooming Originals (find her on Facebook) puts the bunny right on your front door. Covered with cream-colored berries and adorned with a hot pink bow, you can rest assured the Easter bunny won’t miss your house this year.